The earliest buildings at the windswept upper end of Elm Grove were the workhouse of 1866 (now Brighton General Hospital) and the racecourse. Houses followed more slowly and in 1901 an iron church in the parish of St Martin was opened (Shipley p21). In 1912 funds were being raised for a permanent church (CDG 221 p92), but construction was delayed until 1933-34. The architect was H S Goodhart-Rendel (ICBS) and the church is the only C20 one in Brighton to stand comparison with its C19 predecessors. It is built of brick on a cruciform plan and cost about £15,000 (CDG 18 p341). The plan is not obvious since the transept roofs continue the lines of the aisles. Buttresses punctuate the nave inside and out, where they are to be seen above the upper part of the canted roof. Inside, small arches in these make the aisles little more than passages. Unusually, the tower rests on beams over the chancel, not arches. It has a saddleback top with two tiers of segment-headed openings like the main windows and large brick crosses on the main sides. Other ingenious touches include the canted west end, windowless except for one high up; inside, there was a gallery here. Roderick Gradidge (RIBA Gallery: Architects of the Art Workers Guild, p8) discerned a link to the work of Sir Giles G Scott and instanced the now lost colouring of the interior and the angular brick forms as an early instance of Goodhart-Rendel’s revival of Victorian forms. 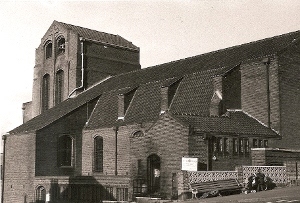 Structural problems and the discovery of asbestos in the ceiling put pressure on a dwindling congregation and in 1980 the church was made redundant. After standing empty for 10 years, during which time there were proposals for both preservation and demolition, it was converted into 24 flats. This meant dividing the interior, though outside only skylights in the aisle roofs reveal the change. Inside, the space under the tower has been left open and so has the north aisle. Paintings: (North chapel, retained after the conversion) Murals of the Nativity on three walls by H Feibusch, 1940-41 (Powers etc p12).